From Garden State Parkway North: To Exit 160-Fair Lawn. Turn left at traffic light off of exit onto Paramus Road, just past Garden State Plaza Shopping Mall. Proceed to third traffic light (past Wendy's fast food restaurant and over a ramp), turn right at sign for Route 4 West/208 North, Merge onto Route 4 West. Stay in right lane. You will quickly see a sign for the Saddle River Road (North) exit. Take this exit, bear right, and the doctor's office is located three blocks on the left. From Garden State Parkway South: To Exit 163, Route 17 South. Stay in right lane and exit onto Route 4 West. Proceed approximately one mile. Stay in the right lane. 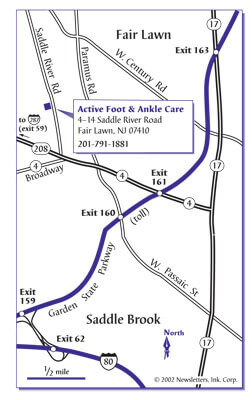 Take the exit for Saddle River Road (North) bear right and the doctor's office is located three blocks on the left. From Route 4 Westbound: Proceed approximately one mile past the Route 4/17 intersection. Stay in the right lane. Take the exit for Saddle River Road (North), bear right and the doctor's office is located three blocks on the left. From Route 4 Eastbound: East to Paramus Road/Ridgewood sign, just before Wendy's fast food restaurant. Merge onto Paramus Road and just over the ramp, take the first exit on the right, Route 4 West/208 North. Merge onto Route 4 West Stay in the right lane. You will quickly see a sign for the Saddle River Road (North) exit. Take this exit, bear right, and the doctor's office is located three blocks on the left. From Route 208 South: Take the Plaza Road/Fair Lawn exit. There is a Mobil gas station at this exit. Turn right at the end of exit onto Plaza Road. At the first traffic tight turn left onto Morlot Avenue (Citgo and Gulf gas stations). Bear left up ramp aver Route 208. Continue to next traffic light and turn right onto Saddle River Road. The doctor's office is one block on the right. From Interstate 80 Eastbound: Exit 62A Saddle Brook. Follow signs to Garden State Parkway North Follow directions above from GSP North. 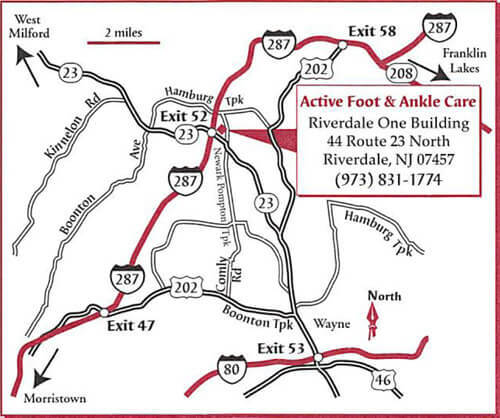 This office is located in the Riverdale One office building on Route 23 North, just before the Route 287 intersection. Entrance is on Newark Pompton Turnpike. From Route 23 Southbound (from Butler): Continue past Route 287 (stay in right lane) and exit at the West Parkway U-Turn back onto Route 23 North. Take the next exit on right at Gulf gas station onto Newark Pompton Tpke. Go straight and turn left into our parking lot (Riverdale One). Take the elevator to the first floor. From Route 23 Northbound (From Wayne): Take right lane exit at Gulf gas station onto Newark Pompton Tpke. Go straight and turn left into our parking lot (Riverdale One Building). Take the elevator to the first floor. From 287 Northbound (From Morristown): Take exit 52A Riverdale/Wayne, which puts you onto Route 23 South. Stay in right lane, and exit at the West Parkway U-Turn back onto Route 23 North. See directions above. From 287 Southbound (From Mahwah): Take exit 52A-B Riverdale/Wayne/Butler to exit 52 A, which puts you onto 23 South. See directions above from Route 23 Southbound. From 46 Eastbound (From Pine Brook): Follow signs for 23 North, Butler/Wayne. See directions for 23 Northbound. From 46 Westbound (From Clifton): Follow signs for 23 North, Butler/Wayne. See directions for 23 Northbound. From 80 Eastbound (from Denville): Proceed east to exit 53 (Wayne/Clifton). Merge onto Route 46 East. Stay in right lane and take the next U-Turn exit, at Riverview Drive, and follow signs for 23 North, Butler/Wayne. See directions for 23 Northbound. From 80 Westbound (From Saddle Brook): Proceed west to exit 53, Route 23 North (Wayne/ButlerNerona). Follow signs for 23 North - Butler. See directions above for 23 Northbound. Route 208 North (From Oakland): Follow 287 South (Oakland/Morristown). See directions above for 287 Southbound.